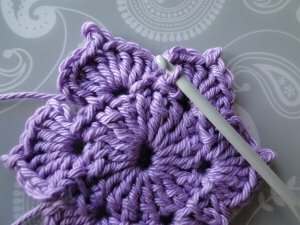 Use whatever yarn you like. My flowers are made with sports weight cotton and a 3 mm hook. They measure two and a half inches wide, or just over 6 cm. We begin with a magic ring - here's my page about that if you're not familiar with it. Round 1: Ch 4, 17 trc into magic ring. ch 3, 3 dc, ch 2, ss into 2nd ch from hook, (picot made,) 3 dc, ch 3, ss. Miss next stitch (which is hiding a bit under your petal! See pic below.) Sc into next stitch. 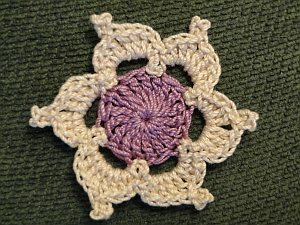 *Into next stitch work ss, ch 3, 3 dc, ch 2, ss into 2nd ch from hook, (picot made,) 3 dc, ch 3, ss. 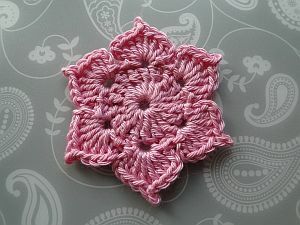 Repeat from * to * three more times to make five petals. Into next stitch work ss, ch 3, 3 dc, ch 2, ss into 2nd ch from hook, (picot made,) 3 dc, ch 3, ss. Weave in ends - see how I finish below. Round 1: Ch 4, 17 dtr into magic ring. ch 3, 3 tr, ch 2, ss into 2nd ch from hook, (picot made,) 3 tr, ch 3, ss. Miss next stitch (which is hiding a bit under your petal! See pic below.) Dc into next stitch. 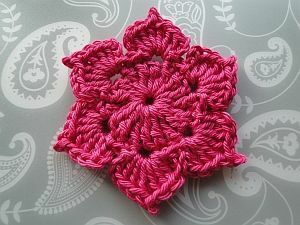 *Into next stitch work ss, ch 3, 3 tr, ch 2, ss into 2nd ch from hook, (picot made,) 3 tr, ch 3, ss. 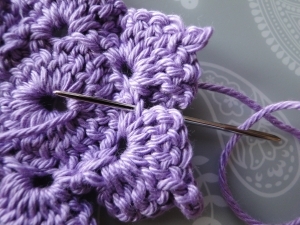 Into next stitch work ss, ch 3, 3 tr, ch 2, ss into 2nd ch from hook, (picot made,) 3 tr, ch 3, ss. Some photos to show you the action! I chained 4, then worked 17 stitches into the ring, pulled it fairly tight and slip stitched into the first stitch - not the top of the 4 chain! 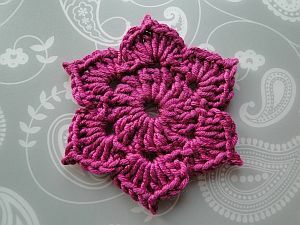 So you work your first petal - then you miss a stitch. 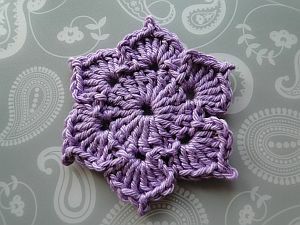 But that next stitch is almost hidden away under the width of the petal. 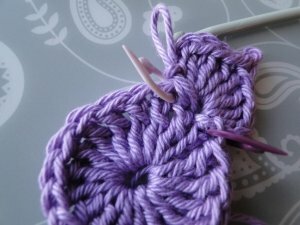 Don't be afraid to pull the petal out a bit to check for the next stitch you must miss. It is there, I assure you! Tie off, pull your tail end gently to tighten. Weave the end into the back. 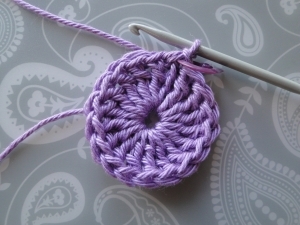 I thread it through the back loop of the same stitch I last worked into - that is, the joining slip stitch at the beginning of the round.